Corps (FRSC), Rivers State Sector Command said it was liaising and collaborating with the Rivers State Ministry of Transport and the Special Adviser on Traffic to ensure safe motoring environment in the State. The Sector Commander, Mr Andrew Ayodele Kumapayi made this known in an interview with The Tide correspondent in his office soon after the commemoration of the 2016 West Africa Road Safety Organisation (WARSO) Day, held in Port Harcourt last week. 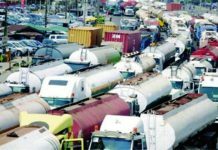 Kumapayi said for safety on the roads, he had set-up a traffic control unit and that the unit is working assiduously to dismantle all unnecessary traffic bottlenecks in Rivers State. He, however, noted that they were facing challenges of logistics as regards patrol vehicles, but expressed optimism that the FRSC – friendly Governor, Chief Nyesom Wike, would redeem his promise to assist the command with three vehicles and a towing truck to help them achieve their goal for the state. According to him, the patrol vehicles and the towing truck, when provided, would assist in clearing obstructions along major roads in Port Harcourt and its environs to further ensure safety on the road as well as promote free-flow of traffic. The State FRSC boss appealed to all motorists to co-operate with the command in order to serve them better.